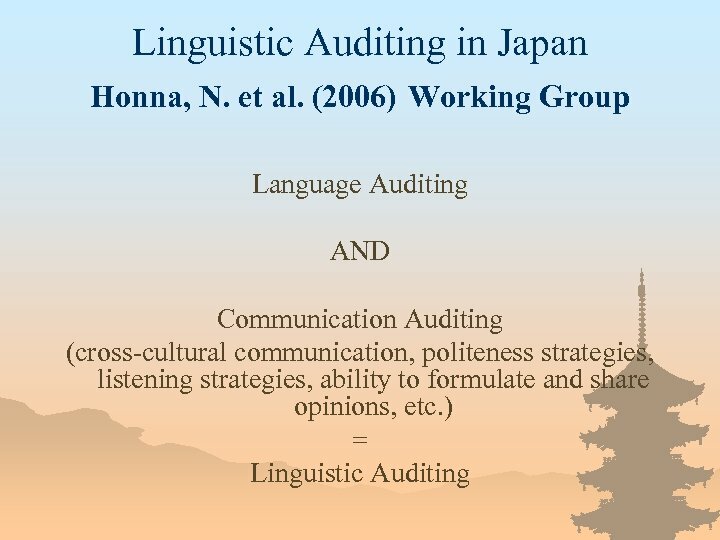 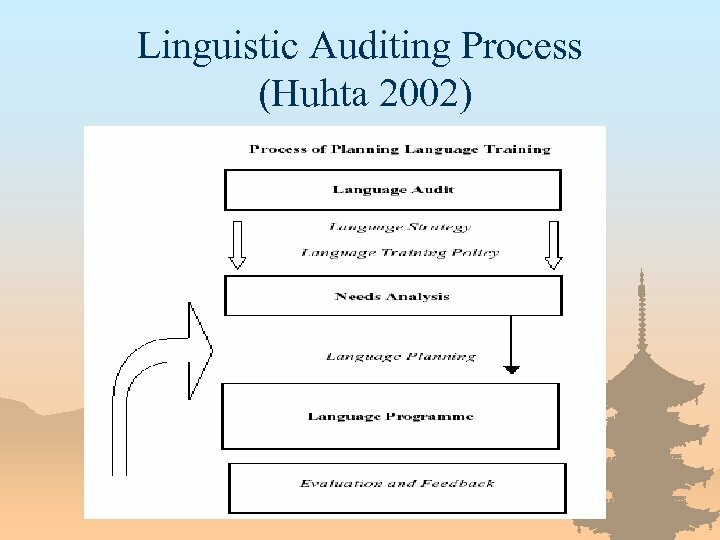 ＯＵＴＬＩＮＥ | What is linguistic auditing? 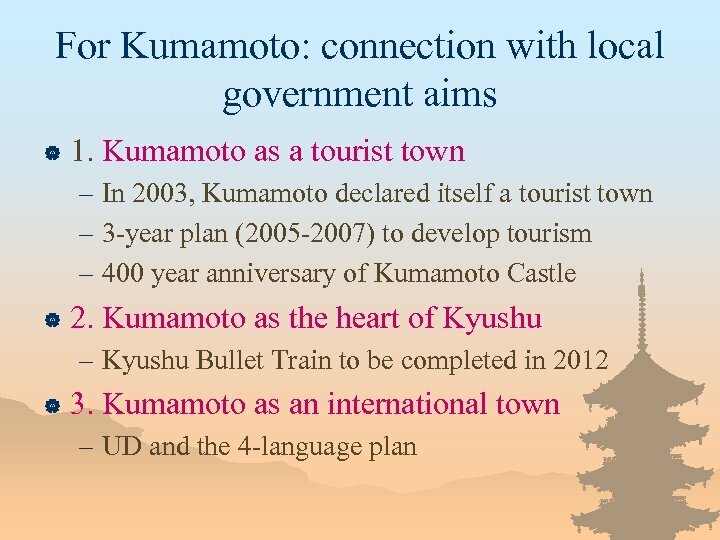 | Why Kumamoto? 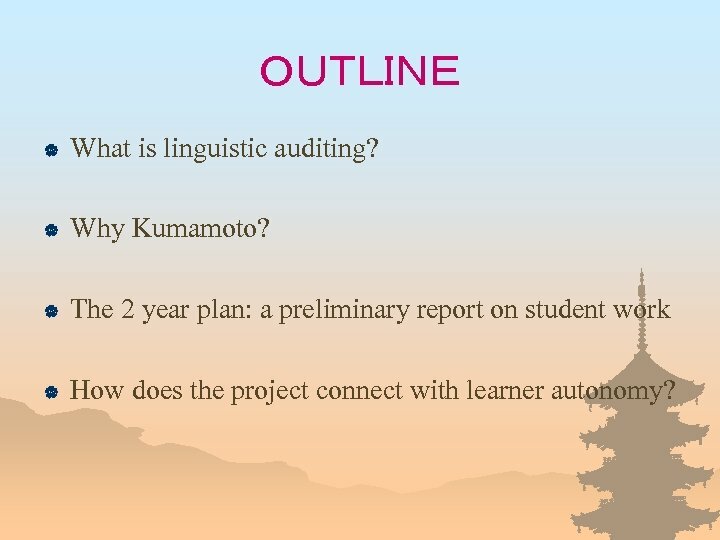 | The 2 year plan: a preliminary report on student work | How does the project connect with learner autonomy? 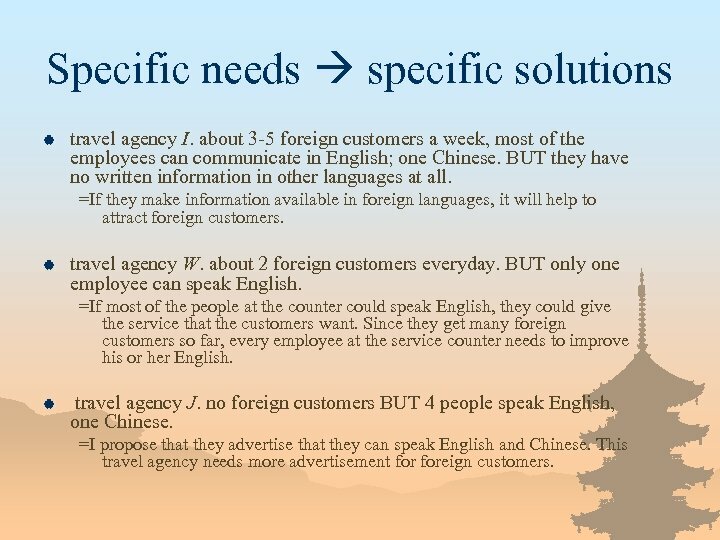 Specific needs specific solutions | travel agency I. about 3 -5 foreign customers a week, most of the employees can communicate in English; one Chinese. 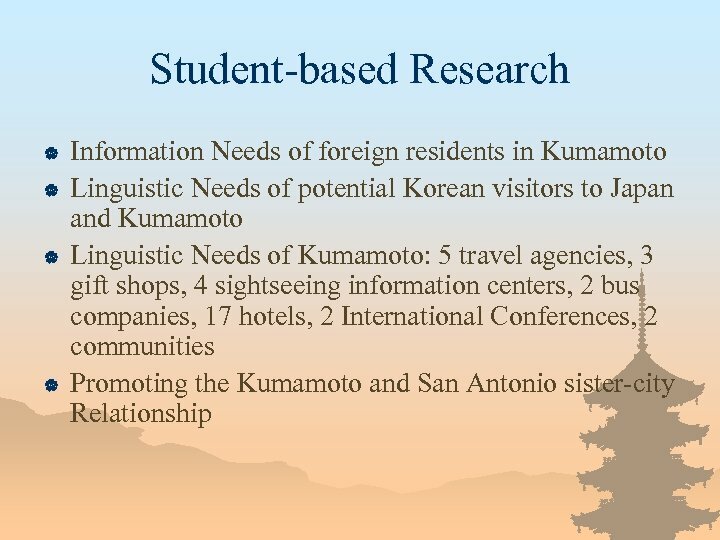 BUT they have no written information in other languages at all. 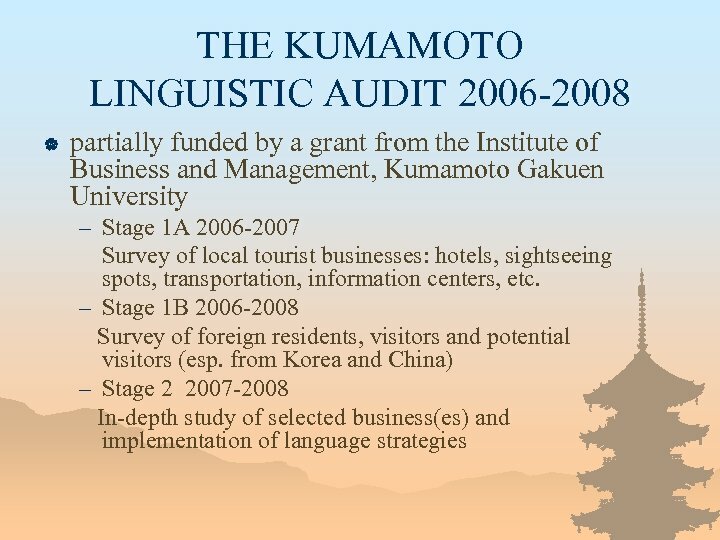 =If they make information available in foreign languages, it will help to attract foreign customers. 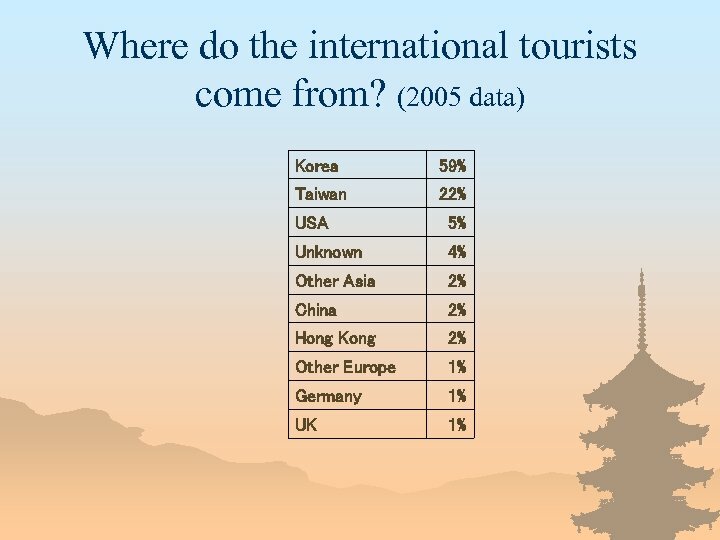 | travel agency W. about 2 foreign customers everyday. 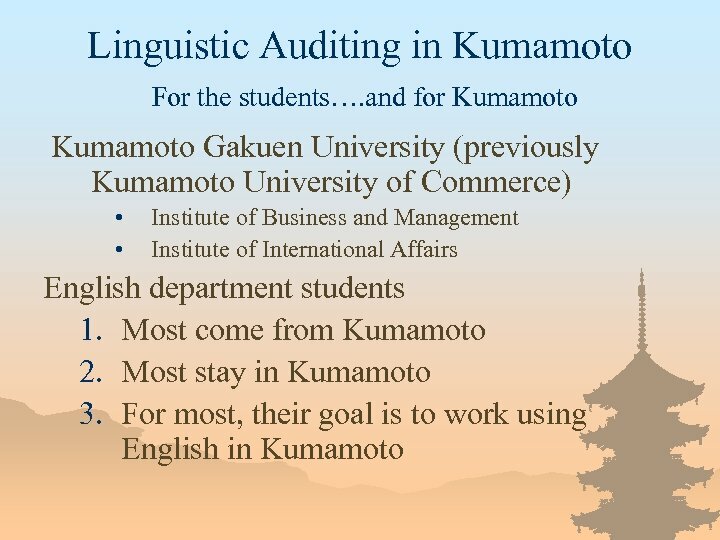 BUT only one employee can speak English. 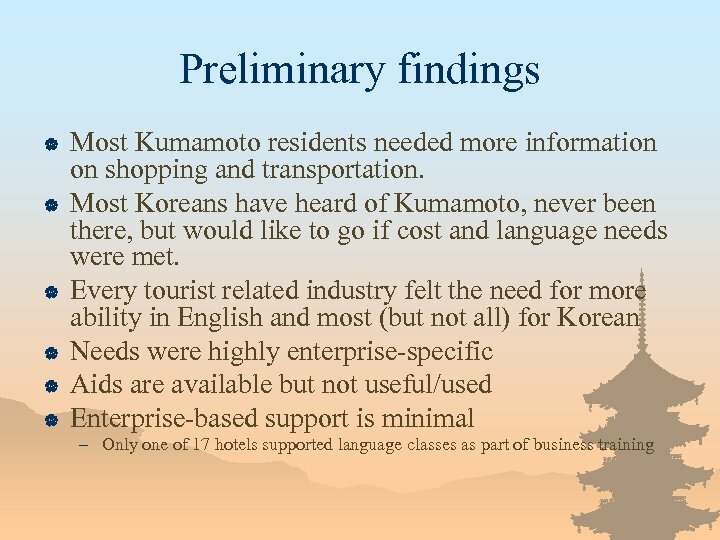 =If most of the people at the counter could speak English, they could give the service that the customers want. 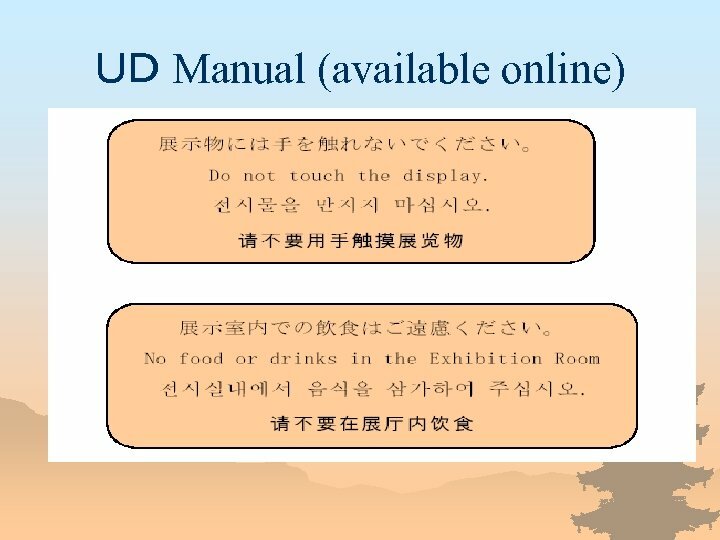 Since they get many foreign customers so far, every employee at the service counter needs to improve his or her English. 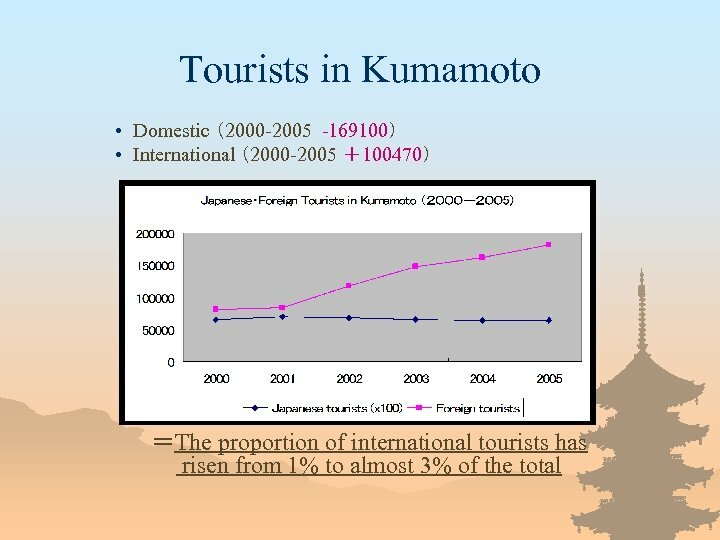 | travel agency J. no foreign customers BUT 4 people speak English, one Chinese. 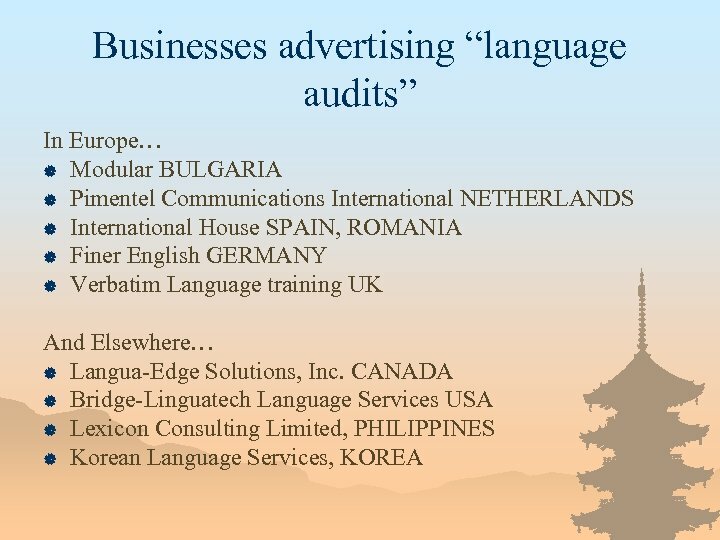 =I propose that they advertise that they can speak English and Chinese. 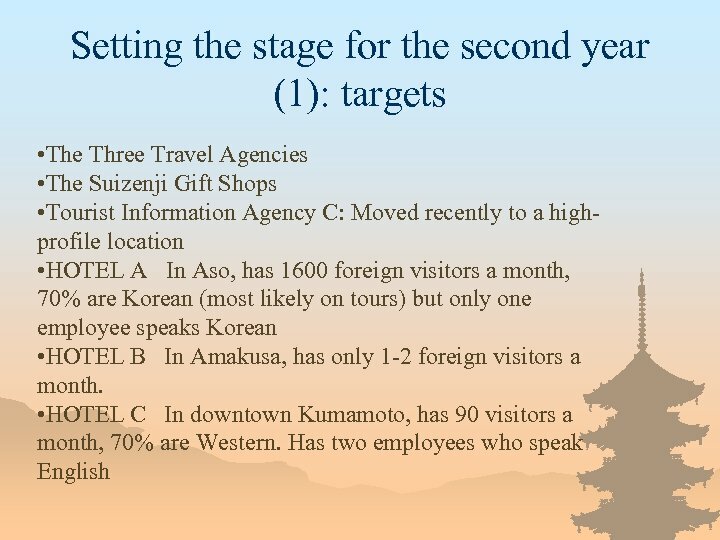 This travel agency needs more advertisement foreign customers. 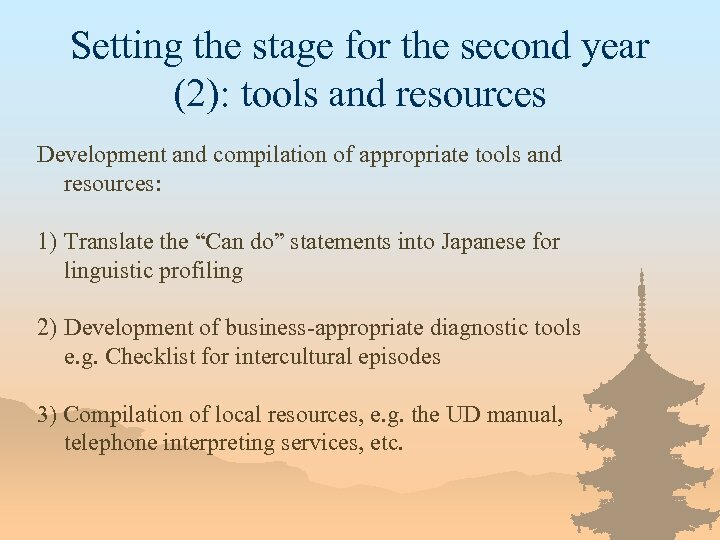 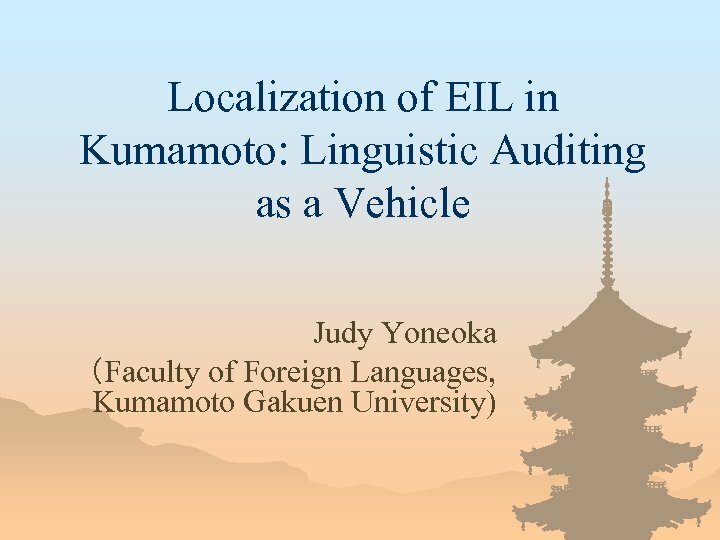 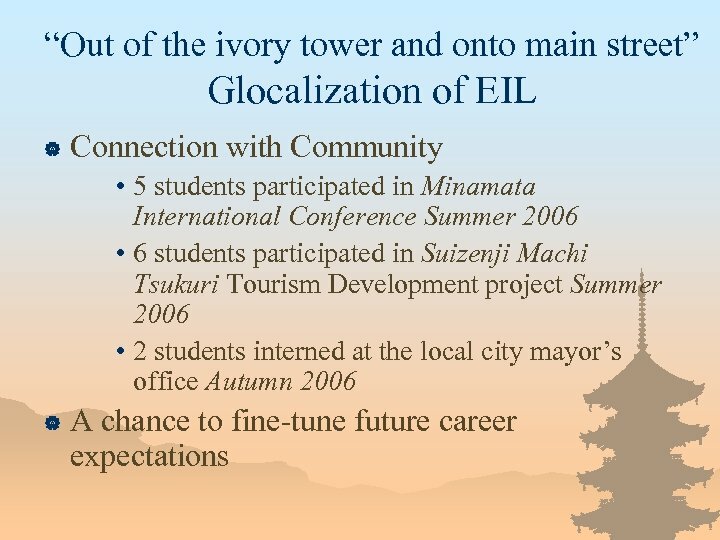 Setting the stage for the second year (2): tools and resources Development and compilation of appropriate tools and resources: 1) Translate the “Can do” statements into Japanese for linguistic profiling 2) Development of business-appropriate diagnostic tools e. g. Checklist for intercultural episodes 3) Compilation of local resources, e. g. the UD manual, telephone interpreting services, etc.